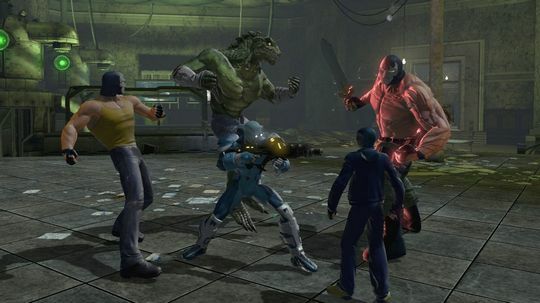 Review The backstory to DC Universe Online reads like that of so many of Metropolis and Gotham City's superheroes and supervillains. Lift the cape and pull back the mask and DCUO reveals itself as a regular-Joe action-brawler that gained special powers after falling into a vat of MMORPG mutagen. The result is a symbiosis of the relentless immediacy of traditional open-world actioners, such as Crackdown and Prototype, with the the questing, progression and social interactivity of MMORPGs, such as WoW and Everquest. It's a clever attempt to combine the genres and reconcile often disparate types of gamer, and it's one that almost works. But, like all superheroes, DCUO constantly struggles with its double identity: part mild-mannered introduction to persistent online gaming and part powerful alter ego satisfying an exacting audience of seasoned PC players. DCUO's familiar fiction cleverly eases noobs into the esoteric MMORPG world. Character customisation is demystified by choices grounded in comic book lore: male or female; good or evil; cape or wings; spandex or combats; super speed or flight; ice blast or magic. But simple choices belie a deep customisation system. The choice of mentor – Superman, Batman or Wonder Woman for good; Lex Luther, the Joker or Circe for evil – informs main campaign questing. Primary powers decide combat styles. Secondary powers determine roles in group play - tank, crowd control, or healer. And your costume... well, that just makes you look super cool or epic fail. Is it a bird, is it a plane? Whatever it is, kill it! 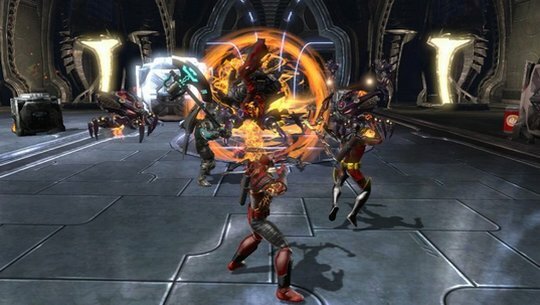 DCUO's opening few hours reinforce Sony Online Entertainment's effort to appeal to all players. Simple, bite-sized quests introduce combo mechanics to veterans more used to ability-based combat, while offering novices time to grow accustomed to equipment menus, maps, quest lists and skill trees. And after just a few hours of levelling, the playing field is itself levelled.